Pasta & bakery - Learn to COOK & MEET new international friends! 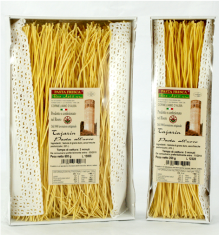 A choice of premium Italian pasta & bakery delicacies carefully selected by "Cook & Meet Emporio" directly by the producers and delivered to your doorstep. 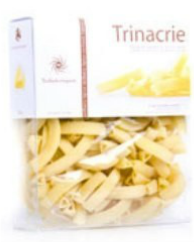 Description: the classic, delicate, elegant thin "tajarin" is a staple of Piedmontese cuisine, produced according to traditional recipes by a family-run gourmet atelier in the heart of Langhe region. Ideally served with a white truffle dressing or a rich meat ragu´. Ingredients: durum wheat semolina, eggs (28%), spinach. 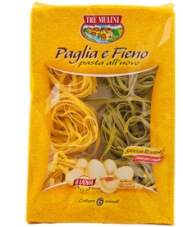 Description: literally "straw and hay" is a tasty and colorful Italian pasta made with classic tagliatelle and the green spinach variation. Ideally served with a rich Bolognese ragu´ or tomato sauce. 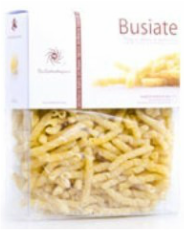 Description: bronze extruded, slow drying typical delicacy from Sicilian crops. Ideally served with a rich mediterranean "puttanesca" sauce or an elegant tuna or swordfish dressing. 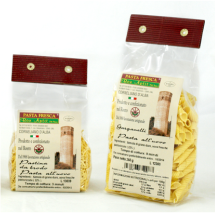 Description: the classic mediterranean "garganelli" produced in a family-run gourmet atelier together with "fettuccine", "tagliatelle", "pappardelle" and "lasagnette" flavored with chili peppers, rosemary, truffle and Nebbiolo. Ideally served with a rich mediterranean tomato or fish sauce. Ideally served with a rich mediterranean tomato sauce or pesto. 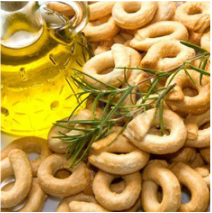 Ingredients: flour, white wine, extra virgin olive oil, seasoning. Description: a classic tasty dry bread delicacy, available also in the spicy chilli variation.